I'm feeling very fall, very much like it's time to go inside every afternoon and hibernate because it's so dark. The time change messed me up more than it should, so basically I'm ready for bed as soon as we finish eating each night--and we eat early. Naturally this means I haven't been in my garden since, oh, I don't know... August or something. I kind of forgot I had one. But last night I was roasting a whole chicken (hold your applause for my domestic skillz, please) and I needed herbs. I was like oh, you have herbs in your garden, Dummy! So I went outside to see if any of them were left so I could make a little herb butter.... and I had unknown veggies! Nothing spectacular, but it made my little day to bring all this inside. Not pictured: the sugar snap peas I ate before I got back in the house. Whoops. 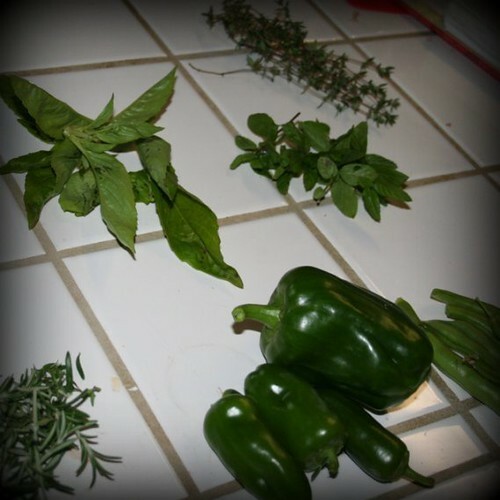 But I had basil, mint, rosemary, thyme, three sweet peppers, one bell pepper, and about 10 green beans. Veggies in the garden remind me so much of summer. I'm missing it so badly--the warm temps, the free time, the tomatoes. Today was a nice little reminder of how nice it is to have fresh food just outside my back door. I think I need to check the garden more often. The rest of those peas should all be ready very soon.